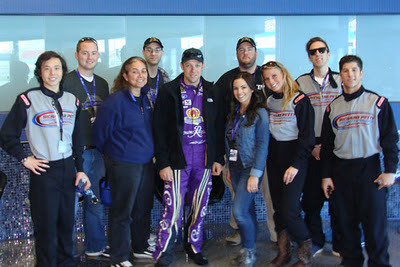 NASCAR Race Mom was honored to meet NASCAR Sprint Cup Driver Matt Kenseth in 2011 during a media event at the Las Vegas Motorspeedway. Mr. Kenseth could not have been more enjoyable, helpful, and fun. Needless to say, I really like Matt. That being said, Kenseth’s No. 20 Joe Gibbs Racing Toyota failed in the laser inspection station which is used by NASCAR insure that all of the Sprint Cup Cars comply with series rules. The station measures various areas pertaining to the chassis including alignment, tire chamber and axle housing. 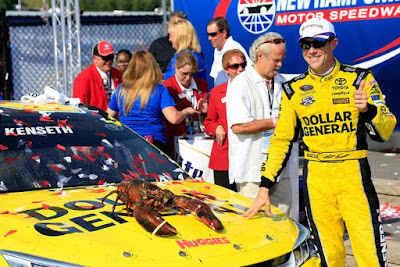 The failure means that Kenseth could have benefited from more side force, and thus, better turn-in on a short oval like New Hampshire. Of course, that would give the #20 car an unfair advantage over the other drivers, including runner-up Tony Stewart who desperately needs a win. Disappointingly, it was announced yesterday that driver and team would suffer a minor penalty. In a series, where a premium is paid to race winners, Kenseth was just penalized fifteen driver points and his crew chief Jason Ratcliff was fined $25,000. Most importantly, Matt has been allowed to keep the victory and those all-important three bonus points awarded for that win which will be applied to his Round One total in the Chase for the Sprint Cup Championship! Whereas NRM is still reserving the right to refrain from asserting that the #20 team purposely cheated; it is this writer’s humble opinion, that this NASCAR ruling sends a clear message that cheating to win might be a smart team strategy. Had Kenseth’s finish be re-positioned to the last car on the lead lap, teams would surely be more diligent to persevere their race vehicle within NASCAR Guidelines. What is your opinion – was Kenseth’s penalty suitable? Within in the confines of current rules... yes penalty was just. They still remiss to share failure. But R&D visit is to comfirm fail and figure out why. Damage? Intentional manipulation of car or parts made for intentional failure. Or garden variety had car at edges of conformity and stress, adjustments and track incidents wothout intent which is what was found. I believe in harsh penalties for any cheating proven. Not for violations that are without intent. Esp for a car that was clean prerace all weekend. Sorry just as all inspections are "go or no go". All finishing positions should follow suit. Go you keep your spot. No Go you finish last, get last place finish and points money goes to Nascar foundation as a fine. Simple as that. No suspended crew chiefs or team members. Less complicated more costly. But that is to simple, it has to be complicated.